The profusion of blooms and vibrant colours splash the landscape making it a treat for the eyes. It is mid spring…..almost the end of winter. But the chill still persists. It poured last night. We could hear the rain lash on the windows heavily, announcing that the winters are here to stay for some more time. Yesterday, we perceived some movement behind the lemon tree. It was a white wagtail looking for insects in the wet mud. 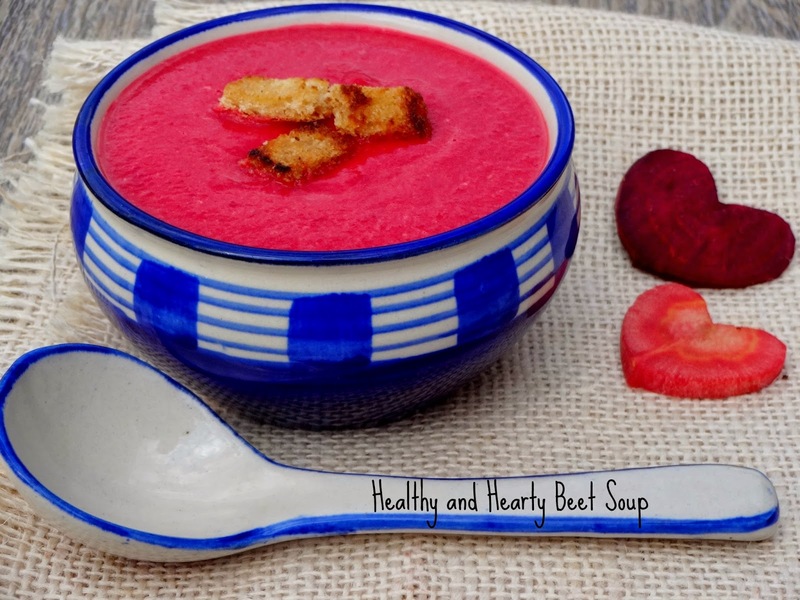 Hot afternoons and cool evenings, a bowl of soup just works wonders with dinner. Made Beet Carrot soup yesterday. A simple yet wholesome soup best enjoyed with toasted bread dripping with butter. Peel the vegetables and chop into small pieces. Heat oil in the pressure cooker. Add chopped onions. Fry for 3 to 4 minutes till tender. Add rest of the vegetables. Add 1 teaspoon salt and 1 cup water. Cook for 2 whistles. Cool. Transfer to a blender and blend to a liquid. Add 2 cups water and simmer for 20 minutes. Serve hot with croutons or sprinkle pepper before serving. You can also serve the soup chilled. Oh my, what a beautiful colour! 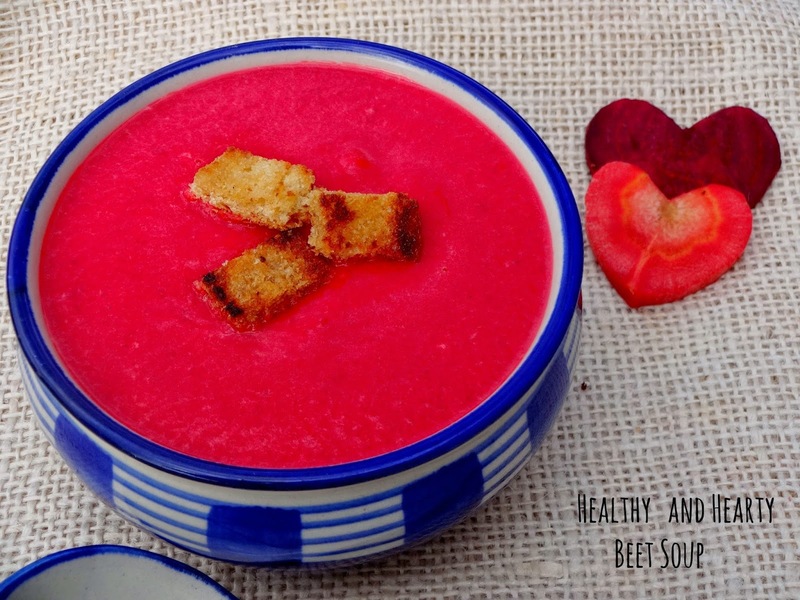 Beetroots have the colour of love :) And those pretty heart shaped carrots and beetroots pieces just enhance the mood :) Very nice and healthy recipe Namita. Adding potato into soups is new to me. The potato maybe giving the dish a thick creamy texture. I should keep that in mind next time I try some soup. Lovely looking soup Namita. I have a lot of beetroot futures in my veggie garden that I am starting to harvest. For the very first time this year I succession planted beetroot and have been eating them simply steamed of late and turning the steaming water into a delicious vegan gravy that has a lovely pink colour. They say that eating colourful food is really good for you. I think we have both had lots of "goodness" via our food this week :).